It is hard to believe that the "Voice of India", Ishmeet Singh, is no more. Like a shooting star, he's come and gone ... in a blink of the eye! As I heard the shocking news this morning, the floodgates of recent memories opened and tears flowed unabashedly. There was a buzz at the IIGS's 68th International Sikh Youth Camp in May earlier this year in Khandala, near Pune (India). Ishmeet was coming to camp! During the evening divan (service), I found myself sitting next to a young 19-year-old with a look of cheerful innocence on his face. I remember how his jaw dropped when I asked him if he sang ghazals or Bollywood songs, or whether he was a classical singer. He looked at me as if to say, "Which planet are you from?" I kicked myself for showing such ignorance when I saw him smothered by campers who were simply ecstatic to have him in their midst. I explained to him that I did not watch Indian TV at all. His smile told me that I was forgiven. Over the next few days, as I got to know Ishmeet, I saw what a special young man he was. Not because he had just won the Star TV contest and become the Voice of India, or because he felt that the award was a special gift from Guru Nanak on whose prakash utsav (Birth Anniversary) day he received the award. Not because right after he won the award, he promised that his first album would be of shabads, or because he took his role as an icon for the Sikh youth seriously. Ishmeet, to me, was really special because his success had not gone to his head and, at heart, he remained the sweet, simple boy from Ludhiana with the love of Sikhi swelling in his heart. He saw himself as blazing a trail for his young Sikh brothers and sisters who he hoped would follow their dreams, achieving great successes while proudly displaying the Khalsa form and spirit. He felt that he had been given a great responsibility: to inspire and to coax the best out of the Sikh youth. Ishmeet had a freshness about him. He became a part of the camp routine, performing melodious kirtan in his velvet voice during the morning and evening divans. He sang from the heart in a voice that sounded like silk. He sat through the lectures and avidly participated in discussions. During an afternoon session, when the rest of the youth was hemming and hawing about what they would be looking for in a mate, and answers like "someone who respects my parents" or "someone who is well educated and independent" were unconvincingly bandied around, Ishmeet's "I am looking for a beautiful Sardarni" brought peals of laughter and approving pats on his shoulder. Had he found his beautiful Sardarni? He did not want to shatter the mystique. But something told me that there was a young Sikhni out there who had already stolen his heart. Every evening after langar, the courtyard of the campground rang out with the beat of Punjabi songs and popular Bollywood numbers. The campers sang and swayed with him and screamed as he broke into familiar rhythms. Ishmeet never hogged the show but passed the mike around, encouraging everyone to take his or her turn to sing. The joy of singing with a celebrity shone on the young faces of the campers! I am sure there were some that dreamed of following in his footsteps. Suddenly, it seemed, there was no glass ceiling - even in the bright and glittery world of music and show-biz. He was dogged at each step with some camper or the other badgering him for a photograph or an autograph. Girls ran circles around him and young boys clambered all over him, tugging, hugging, touching, hoping that a speck of his charisma would rub off on them. Never for a moment did Ishmeet show an iota of annoyance. When someone commented on his patience, he said that it was only because of those who loved him that he had tasted fame and glory. Otherwise, he would be like so many out there...unrecognized and forgotten on the wayside. Was everything hunky dory on his road to fame, I asked him in a private conversation. Ishmeet already had lucrative playback singing assignments, was brand ambassador for products, had offers to anchor TV shows and to star in TV serials. A cloud passed over his sweet countenance, when he heard my question. "It is very lonely at the top, didi", he said to me. "Lonely?" I queried, "with thousands of fans and adoring masses?" "Lonely because those that are close to you become jealous of your success. You become a stranger to your friends because you do not inhabit their world anymore. They shut you out and move on because they view you as a celebrity, and no more a part of their everyday lives". He said that his days were spent in rigorous recordings and evenings found him exhausted. As he lay in bed, missing the warmth of home and musing on what his friends in the neighbourhood were doing, he was too tired to call them. And even when he did, there were more stilted silences than real conversations. If he talked to them about his world, they would think he was showing off, he said, and they did not share their stories because he was in a "different league" now. Slowly, the connection broke and awkwardness crept in. Ishmeet said that the joy of knowing that his people rallied behind him kept him going. If his community had showered him with affection, Ishmeet, too, had touched everyone with his special brand of warmth. His ready smile was like a sunburst, stirring everyone around him. I met him again at the camp held in Dehradun last month ... only a few short weeks ago! ... and we chatted about his plans for the future. He was going to come to the Darbar-e-Khalsa in Los Angeles in December and later go on a tour of the U.S.
Plans and dreams that have today been snapped midstream! Plans that will now be washed away by the collective tears of the community. His sudden and tragic death by drowning has left millions of his fans with a deep sense of loss. Haunted by a bundle of unanswered "why's", we will replay his music over and over again to fill the gaping hole of our bereavement. Precious is human life; only the pious are granted it. And, through Grace, body and mind are both comforted by His Love. Surrendering to His Will, received art thou with honour in His Court. 1: Akashdeep Singh Sachdev (Mumbai, India), July 30, 2008, 3:42 AM. I'm deeply moved by the news and by this well-described and emotional piece. A lot of the urbaners thought that Ishemeet was an open and shut case with just a stroke of luck and blessings of the community. But after reading this, anyone should be silenced and will give him due respect ... unfortunately, he is no more to greet the fact that he has turned his crtics into admirers. You were a Role Model, Ishmeet, and still are in our hearts. R.I.P. 2: Jag Singh (Birmingham, England), July 30, 2008, 5:33 AM. 3: Kavi Raj Singh (Tustin, California, U.S.A.), July 30, 2008, 5:37 AM. Ishmeet, you will be missed. Meeting you this summer during the two IIGS camps was truly a pleasure. Your sudden demise has left everyone in a state of shock. I hope you find a place in the house of Waheguru ji and may Waheguru ji grant your parents the strength to deal with your loss. Your melodious voice will keep you alive in our hearts for times to come! Keep smiling! 4: Parambir Singh (Dubai, U.A.E. ), July 30, 2008, 6:45 AM. A shocking news for me and my friends when yesterday night I got a call from a Pakistani friend who is a great fan of Ishmeet. We all used to send sms for him, and this news has made us very sad, to say the least. Not knowing him personally but from what all that Jessi has written, he was a real Singh, down to earth and simple ... I pray that God gives him a special place. May Waheguru ji be with his family. 5: Lakhvir Singh Khalsa (Nairobi, Kenya), July 30, 2008, 8:07 AM. As he departs, his humility, devoted example and simplicity awakens an inner, slumbering soul in me. It is so impossible to comprehend the Hukam of Akaal Purakh, and even try and understand why such unfortunate things happen to such lovely souls, but it remains as a reminder to us all that life is but a dream. An incident like this begs us to awaken ourselves to the true nature of life and existence - everything is in His Hands. God bless you, Ishmeet Singh ji. You will continue to live in the inspirations you leave behind. Waheguru Ji. 6: Rubani (India), July 30, 2008, 8:14 AM. May your soul rest in peace, Ishmeet veerji ... I had an awesome time meeting you at the IIGS camp ... you will remain in our hearts forever, and your melodious voice too ... May Waheguru ji bless you. 7: Dr. Jagmeet Kaur (Bhopal, India), July 30, 2008, 8:37 AM. Ishmeet was truly a youth icon and meeting him at the Khandala camp was really a pleasure. The one thing about him that touched us all was his humility and the fact that he was truly proud to be a Gursikh and a role model for all the Sikh youth. Jessi didi's article has really touched a chord and very vividly described this young man. May God rest his soul and give strength to his family. God bless. 8: Aman (Mumbai, India), July 30, 2008, 9:52 AM. Will miss you, Ishmeet ... R.I.P. 9: Parveen (Redwood City, California, U.S.A.), July 30, 2008, 12:02 PM. Thank you for sharing this story with us. I did not even know who he was until yesterday with the news of his death. In the past 24 hours, I have watched so many of his songs on Youtube and listened to his interviews. He seemed like such a confident and well-raised Gursikh boy. Like so many others, I too have become a fan and hope his memory lives on forever. 10: Manjit Kaur (Placentia, California, U.S.A.), July 30, 2008, 12:02 PM. "Joban rute jogi marde ja koi karma vala"! May Waheguru bless the family with courage to face such a deplorable and irreparable loss. Ishmeet, may you rest in peace at His lotus feet! 11: Gurbux Singh (Chatsworth, U.S.A.), July 30, 2008, 12:59 PM. Another reminder of the impermanence of life. We are transients in this journey and S.Ishmeet Singh made a stop and as per the beck and call of Waheguruji, has moved on. Ishmeet is missed by all and we are grateful to the huge contribution he made as a talented and humble Sikh. We pray for him. 12: Jagbir (San Jose, U.S.A.), July 30, 2008, 2:48 PM. Thanks, Jessi ji, for sharing your experiences with us through this heart-wrenching piece. Ishmeet's untimely demise is a huge loss for his family and for the entire Sikh community. Hopefully, Ishmeet's legacy of success and achievement will serve as a true inspiration for the Sikh youth of today! 13: Jasjit kang (Yuba City, U.S.A.), July 30, 2008, 10:00 PM. Great loss to the Sikh Panth. 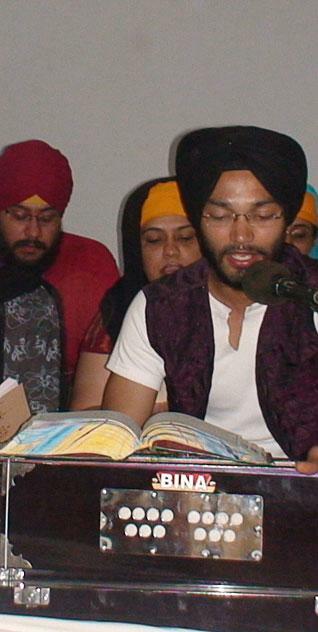 Ishmeet was not only a beautiful singer, he was a true Sikh. This young man had many many years ahead of him to show his real talent to the world. The Sikh Quom will miss him dearly. Also, there should be an inquiry to ascertain whether any foul play was involved. May Waheguru grant peace and rest to his soul, and strength to him family to bear this unbearable personal loss. 14: Harbani Singh (New Delhi, India), July 30, 2008, 10:54 PM. I still can't believe that Ishmeet is not around anymore. He was in Delhi for the weekend. We went out for dinner with him on Saturday and then he was staying at Mandeep's house so all of us were with him the whole night, playing games. I can't get over the fact that that was the last time I met him. Just two days before he ... That was no age for him to go. And I feel terribly sad for his parents. 15: Jassie Banga (Rocklin, U.S.A.), July 30, 2008, 11:21 PM. Sorry to hear about Ishmeet Singh. We miss you, Ishmeet. Life is to short. God bless your parents and your family. 16: Inderpreet (San Jose, California, U.S.A.), July 31, 2008, 1:15 AM. Ishmeet's sudden and untimely death has left the entire Sikh community in a state of utter grief. After reading this article and the way Jessie didi described Ishmeet, I actually feel that we've lost a real-life hero at a time when today's Sikh world really needed him the most, as an icon and as a role model for today's children. I cannot even imagine what his family must be going through at this time. May Waheguru ji give them courage and may Ishmeet's soul rest in peace. 17: Pritam Singh Grewal (Canada), July 31, 2008, 1:16 AM. You had 'miles to go' before you slept, Ishmeet! Your sudden death illustrates the proverb 'Achintay baaz paey'. 18: Jaggi Singh (Sarnia, Canada), July 31, 2008, 6:22 AM. "Tera bhana mitha lage..." Our family and friends adopted this young man as our own son. We watched him grow on the VOI stage. He was ridiculed by some judges, we saw the tears stream down his face, he thanked the judge without getting angry. He remained calm even when one "eastern" judge accused the entire community of supporting him. The tears flowed, he said "thank you". When we saw his parents on VOI we understood his classiness. He showed class when he lost "Super Star". Instead of being bitter, he said he now knows what Hirshit must have felt like. Ishmeet beta, keep on singing in Waheguru's darbar. This household will miss you. 19: Karamjit Singh (United Kingdom), July 31, 2008, 12:00 PM. I only saw and heard his performance following his demise and never had a chance to see him perform live. He indeed had a voice that is rare, born out of a natural gift. It needs to be noted that two Sikhs have, in current times, captured the heart of the nation: Mannmohan Singh and Ishmeet Singh. A tragic loss for the community and his family. 20: Raveena (Thailand), July 31, 2008, 10:27 PM. 21: Bhupinder Singh Ghai (New Delhi India), July 31, 2008, 10:40 PM. Let us all pray for the departed soul and for the bereaved family. Giani Harnam Singh, Head Granthi (cuatodian)of Gurdwara Bangla Sahib has also added another unusual prayer on the day of his death, that we pray to Waheguru that He blesses another kid from the Sikh community to take his place. 22: Anisha (Nainital, India), August 01, 2008, 2:03 AM. Jessi Ji, you have written so beautifully about the departed soul, depicted so well like a candle in the wind. It will be very difficult for the young and old generations to forget Ishmeet, the shooting star. May his soul rest in peace! 23: Harpreet Singh (India), August 01, 2008, 2:14 AM. God's blessings are on some ... and with some, complete injustice is being served ... I am not saying this specifically for Ishmeet, but what I have seen through all these years ... RIP Ishmeet, and God bless your parents. 24: Ravideep (Delhi, India), August 01, 2008, 5:30 AM. My 10-year old son is a big fan of Ishmeet and he especially got his shabad kirtan CD and listens to it regularly. That was the magical effect of Ishmeet on young children - drawing them towards Sikhism. 25: Bhupinder Singh Ghai (New Delhi, India), August 01, 2008, 6:05 AM. Wanted to add to my previous post ... Singh is King, even in death ... the funeral procession that Ishmeet got was fit for a KING. A message for all friends of Ishmeet: do visit his parents regularly, so that they do not feel lonely ... easier said than done. May God give them strength. 26: Sukhwinder Dhillon (Brampton, Ontario, Canada), August 01, 2008, 6:40 AM. Ishmeet, you'll always be in our memories. "Singh is King!" ... yes, you'll always be king in the music world. And I want to thank Jessi ji for sharing these golden memories with us. You have made it as if Ishmeet is standing in front of us, talking, laughing, thinking, singing ... so now, let's do our part and remember Ishmeet and honour his memory! 27: Aneel Singh (Chandigarh, Punjab), August 01, 2008, 8:19 AM. We miss you, Ishmeet. May Waheguru bless the family with courage to face such a deplorable and irreparable loss. We pray that Waheguru gives him a special place. 28: Bicky & Gurpreet Singh (Orange County, California, U.S.A.), August 01, 2008, 1:21 PM. It was quite a shocking message for my kids and me here in California. At first, it was unbelievable and also hard to accept that Ishmeet is no more with us. No more of his golden voice, his sweet smile and innocent face. We were looking forward to meeting him at the IIGS Darbar-e-Khalsa event in California and at the Spinning Wheel Film Festival in Toronto, Canada in October. I loved Ishmeet's singing. He will always be part of my memories. I can't believe, you are not anymore. May Waheguru rest your soul in peace. 29: Manveena & Gurveer Singh (Orange County, California, U.S.A.), August 01, 2008, 1:23 PM. 30: Anupreet Kaur (Orange County, California, U.S.A.), August 01, 2008, 1:25 PM. Our condolences are with the family of Ishmeet Singh. He will remain forever in our memories. He is not gone; we can still hear him. 31: Kanwarbir Singh (Placentia, California, U.S.A.), August 02, 2008, 12:43 PM. Great kid with strong Sikhi values, an achiever and believer in Waheguru Ji. He was appreciated and loved here in this world and I am sure, for his love for Gurbani Keertan, he took along his good deeds and is happy at the Guru's feet. Waheguru Ji will bless the family with courage and understanding that whatever short number of years he was given weren't gone to waste as millions of people were inspired by his Sikhi charisma. Waheguru Saddha Ang Sang ! 32: Jum (Chittagong, Bangladesh), August 03, 2008, 5:20 AM. Ishmeet, you'll always be in our memories. "Singh is King!" ... yes, and you'll always be king in the music world. 33: Jasbir Singh (Ahmedgarh, Punjab), August 05, 2008, 7:02 AM. My daughter, Sagaldeep Kaur (8 yrs) did not eat anything when she heard about Ishmeet's death. Life in our household was not normal for 4-5 days. Everyone asked the questions: How could it happen? Why did it happen? Such a great loss! 34: Gurpreet Kaur (Chino Hills, California, U.S.A.), August 05, 2008, 9:46 AM. 35: Jagdish Singh Panpher (Glasgow, Scotland), August 06, 2008, 4:04 PM. 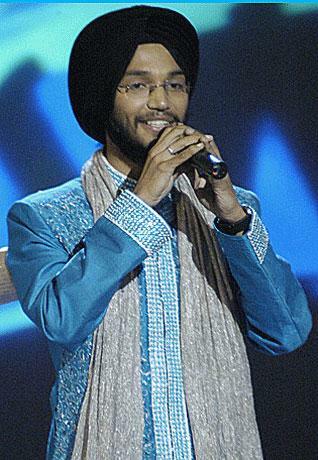 Ishmeet Singh, you have touched the hearts of millions through your voice. Now your untimely death has made us all so sad. Stars like you shine once in decades. Your life was short but it was like a sparker; your memories will always be in our hearts. May you get peace in Heaven! Waheguru, Waheguru. 36: Hardeep Saini (Melbourne, Australia), August 09, 2008, 3:25 AM. Last year I accidentaly found out about the VOI contest while looking for Hindi songs. That was when I began to listen to Ishmeet's songs. The speech by his parents in one of the VOI segments really touched me. I was thoroughly touched by this young man's innocence and singing. I cannot even begin to comprehend what the parents and his little sister and other members of his family are going through right now. God gave this family the highest level of happiness only to take it away suddenly and replace it with the bottomless pit of utter and incomprehensible sorrow. I am utterly at a loss. In consolation, I can only assume that God heard the beautiful shabad recordings Ishmeet made and wanted him in His Court. Ishmeet left this earth while he was still pure, innocent and happy. He must then be in Heaven. Waheguru Ji ka Khalsa, Waheguru Ji ki Fateh. 37: Harjeet Josan (Sydney, Australia), August 11, 2008, 4:15 AM. We are missing you. When I heard about Ishmeet's death, I felt very sad. Ishmeet, we wanted to see you as the brightest of stars. May God give you peace, and comfort to your parents. We will never forget you. 38: Gurjit Dhillon (Sangrur, Punjab), September 06, 2008, 9:43 PM. 39: Rasneen Kaur (New Delhi, India), October 29, 2008, 10:05 AM. Missing you, Ishmeet. Your melodious voice will always keep you alive in our hearts. May Waheguru bless your family with lots of courage to bear the loss. 40: Jobanpreet Singh Ghumman (Washington, U.S.A.), November 15, 2008, 6:00 PM. I have found out that your death was not an accident because I found out through news that you were bruised on the head and lost consciousness maybe falling into the pool. I wish I could bring you back into this world. You had made us so proud! 41: Gagandeep Singh (West Brom, U.K.), January 04, 2009, 2:07 PM. 42: Maria Pires (Dubai), January 16, 2010, 1:42 AM. We remember Ishmeet in our prayers. 43: Pooja Kaur (Karimnagar, India), May 01, 2010, 5:02 AM. 44: Paras (New York, U.S.A.), May 19, 2010, 11:40 PM.